Expand search to view more listings in and around Gurnee. See more offices in and around Gurnee. Offices.net has 1 office available for rent in Gurnee, ready for you to move in and get to work. The work space we offer in and around the city allows you do business in an excellent location from quality office space without having to worry about the long-term commitment and cost associated with conventional commercial real estate leases. Offices.net provides businesses of all sizes with exceptional offices space and executive office suites in Gurnee, Illinois on flexible rental contracts to suit your needs. With an exceptional range of business support services and amenities included, your company can be assured of an easy transition into its new Gurnee premises. Numerous business centers listed on Offices.net come inclusive of an outstanding array of support services consisting of dedicated front desk reception and security personnel, conference rooms and lounge areas, dining facilities and break out areas. On top of this, most of the office buildings also include fast internet and network wiring, parking spaces, all-hours access and on site IT support staff. 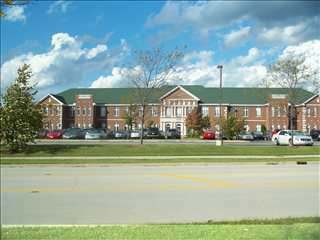 Click on one of the well located Gurnee offices for rent listed on this page. The professional office suites, shared work space and virtual offices on Offices.net are located in prime Gurnee business areas, and are available to rent on easy, flexible rental terms to suit your company's requirements. We also offer executive office suites and flexible office space for rent in other cities throughout Illinois. Contact us and we will be happy to help you find your ideal office space.